This entry was posted in Natural Parenting Products, NP Sponsors and tagged cloth pads, Glad Rags, meet our sponsor, menstrual cups, reusable menstrual products, sea sponge tampons, social justice, sponsor. Bookmark the permalink. Today we are pleased to introduce you to GladRags, one of our valued Natural Parents Network sponsors. 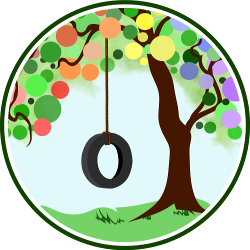 GladRags is one of our beloved sponsors on the Natural Parents Network. Located in Portland, Oregon, this unique company offers a variety of environmentally friendly menstrual products. Initially a home-based business, GladRags is passionate about ecological responsibility and about promoting a positive attitude towards menstruation. We love that this company celebrates women and promotes learning to appreciate the rhythms of the female body! This is a passion that I happen to share. The fact that their products are environmentally friendly makes them a perfect fit for naturally-minded women, and a wonderful sponsor for the Natural Parents Network. GladRags offers a range of menstrual pads, including this day pad. It comes with a holder and two inserts. The holder has a pocket for sliding inserts inside for absorption, and two wings which snap around the underwear to hold it in place. The inserts are for absorption and can be doubled up for heavy flow days. 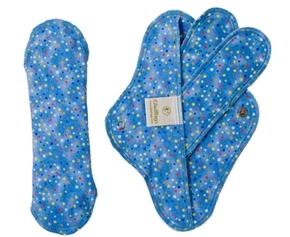 The soft cotton is more comfortable than disposable menstrual pads, yet absorbs well. Inserts are terrycloth surrounded by soft cotton, making them extra absorbent. And as a bonus, the day pads are very pretty! This company also offers a variety of menstrual cups and sea sponges for women who prefer to use internal menstrual products or tampons. There are numerous types of menstrual cups, and GladRags sells the Lunette, the Moon Cup, the Keeper, and the Diva Cup. 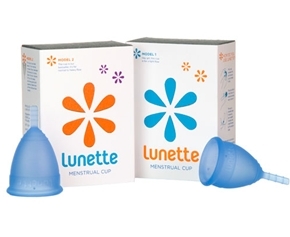 Menstrual cups are made of high quality silicone and easily cleaned and reused for the life of the cup. Another internal alternative product is the sea sponge, which acts similar to a tampon and can be rinsed and reused many times. I appreciate that GladRags offers a range of products. There are many women who prefer to use tampons but would like to switch to a healthier, more natural product. 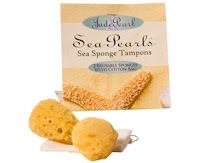 Menstrual cups and sea sponges are a great solution! Women who switch to cloth pads, cups, or sea sponges will sometimes notice changes in their body during their menstrual cycle. Some women find their cycles shorten by as much as several days, or that their flow lightens. Women with painful menstrual cramps can sometimes trace them to the chemicals in disposable products and notice lessening of symptoms when they switch to reusable ones. Disposable products can have harmful chemicals or additives, chafing adhesive, and a tendency to dry out delicate skin. GladRags is a wonderful company that supplies products which are healthier for our bodies and the earth! GladRags is also active in the area of social justice. Once a week, a crew from Oregon Employment Services Corporation arrives to package products for shipment to store shelves and for mail order. OESCo offers employment opportunities for individuals with developmental disabilities. GladRags also partners with Empower Women in Africa to provide girls in Africa with reusable menstrual kits. Too often, girls cannot afford adequate sanitary protection during their menstrual cycle and, to avoid embarrassment, will stay home from school when menstruating. Some drop out of school altogether. Supplying a cloth pad kit can help keep girls in school and boost their sense of self esteem. What a wonderful project! There are links on the GladRags Donate Cloth Pads page for those interested in donating kits to girls in need. NPN is very impressed with this company! They work globally and locally to help celebrate women’s natural body cycles, improve health, reduce waste and chemical pollutants, and reach out to those in need. Beautiful. You can also find GladRags products on Amazon. Disclosure: GladRags has been an advertising sponsor. GladRags links are affiliate links. relevant to your life as a natural parent. Melissa Vose is an artist, writer, women’s advocate, doula, and kid-wrangler. She lives in Western Canada with her wonderful husband and their four noisy, crazy kids. She blogs at White Noise, and is the Editor of Mothers of Change, a birth advocacy organization working to improve maternity care services in Canada. She is passionate about breastfeeding, attachment parenting, ecological living, advocacy work, art, social justice, traveling, and raising awareness regarding mental illness. sea sponge?! that’s amazing! i’ve never even heard of that before. I just heard about the reusable/washable momma cloth like 3 weeks ago, just seen the “Menstrual cups” like last week and now I am just hearing about the sea sponges… this is all so new and weird to me!